It came down to a matter of inches, as Brian Brown rallied from 14th to nip Aaron Reutzel at the finish line in Thursday night’s 27th annual COMP Cams Short Track Nationals presented by Hoosier Tires 25-lap preliminary feature at I-30 Speedway. The dramatic finish put an exclamation point on a vintage STN night in which emotions ran high, and on at least a couple of occasion, boiled over. And it was only Thursday night. But there was Brian Brown, the beneficiary of a pair of late two-car tangles. And “Blackjack” cashed-in in a big way, rallying from third on the green-white-checkered restart to beat Reutzel to the stripe by a foot at most. Dalton Davis crossed the stripe third to lock into Saturday’s $15,000-to-win, $2,500-to-start STN championship finale. While Brown started outside the seventh row, Reutzel outgunned pole starter Davis for the point at the drop of the green and paced the early rounds ahead of Davis and Brandon Hanks. Just as Reutzel was reaching a gaggle of cars at the tail of the field, the race’s first caution flew after nine laps when Minnesota’s Ryan Bowers slipped off the top of turn one. With open track, Reutzel took off in the BC Fundz No. 87 Triple-X with Jerrod Hull battling past Hanks for third by the midway point. Running ninth with 15 laps down and still only seventh with five to go, Brown’s fortunes turned for the good just as quickly as an apparent win came into question for Reutzel. 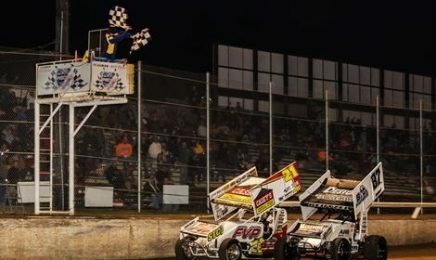 Brown gained a pair of positions to move up to fifth when Hanks and Kevin Swindell tangled in turn three while battling for fifth with two laps to go and then another pair to third when Hull and Tim Crawley got together in turn four, with the latter tangle resulting in an impromptu wrestling match much to the delight of the large crowd. Set for a green-white-checkered run to the stripe, Brown rode the top of the track to perfection and precariously slipped the familiar No. 21 sprint car between Reutzel and the outer frontstretch wall in the mad dash to the line. “I wasn’t sure if I should try to go through there and risk wrecking it or not, but then I was almost alongside him so I was committed,” Brown said. Memphis-area darkhorse contender Davis brought his No. 12d machine across the stripe third to make the cut for his first STN finale. Steering clear of the late race chaos, Ray Allen Kulhanek crossed the stripe fourth with Alex Sewell rounding out the top five.